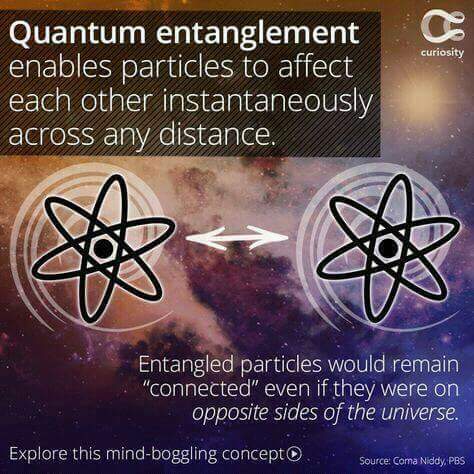 Did anyone of India’s theoretical physicists provide any input at all on the quantum entanglement theory and its role in both cracking the current Cryptographic Keys and in providing an in-theory-un-crackable key to the Aadhaar Project Managers? 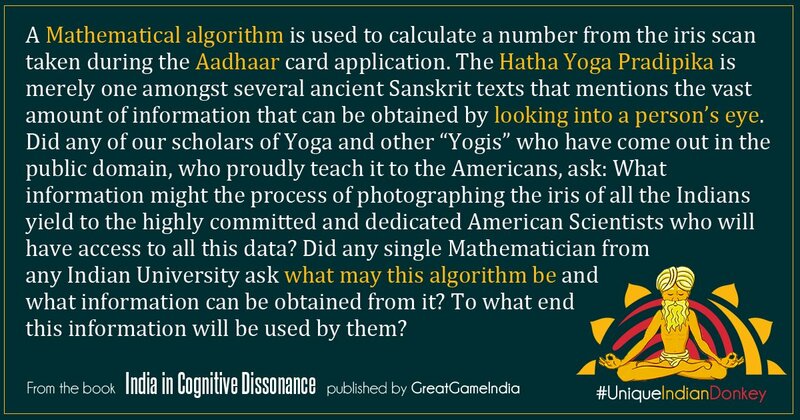 A Mathematical algorithm is used to calculate a number from the iris scan taken during the Aadhaar card application. The Hatha Yoga Pradipika is merely one amongst several ancient Sanskrit texts that mentions the vast amount of information that can be obtained by looking into a person’s eye. Did any of our scholars of Yoga and other “Yogis” who have come out in the public domain, who proudly teach it to the Americans, ask: What information might the process of photographing the iris of all the Indians yield to the highly committed and dedicated American Scientists who will have access to all this data If not, they are not fit to call themselves Yogis or Yoga teachers…they are pimps of the Yoga. Did any single Mathematician from any Indian University ask what may this algorithm be and what information can be obtained from it? If no, they better stop doing Mathematics. They do injustice to Math and the country also does injustice to them. Encryption is a theory that uses advanced fields of Mathematics. Few, if any, Indians are aware that most of the Ramanujan equations were hidden away by the British and were then used to break the codes of the German Enigma machines in the early stages of encryption technology, which was then used to destroy the complete U-boat fleet and keep the Allied ships away from them. In a very good sense therefore, it would not be completely unfair to say that the Indian Scientific Establishment is forced to speak English today, only because of cracking of Cryptographic codes!! Did any Indian mathematician ask the simple obvious question: If, as is commonly known, the British kept Ramanujan with them, why would they release all of his equations to the rest of the world, what major part are they still holding and can they use this to crack our Encryption, and provide this information to this UID-debate? Did any Indian Mathematician studying Cryptography (how many do?) ask to inspect the so-called high-quality encryption of this Aadhaar Project? 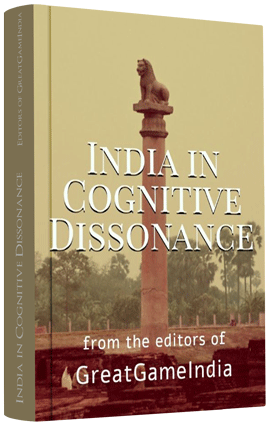 We boast that Srinivasa Ramanujan is an Indian Mathematical genius, but the Supreme Court had to ask foreign opinion on the matter…Did no Mathematician from any Indian University give his opinion on this public debate? If no, they ought to abandon Mathematics. They cannot use it for a higher purpose. Did anyone of India’s theoretical physicists provide any input at all on the quantum entanglement theory and its role in both cracking the current Cryptographic Keys and in providing an in-theory-un-crackable key to the Aadhaar Project Managers, and help them to understand the issue, intead of letting them implement what is shown above have implemented what is an international joke? If no — well, for this once let us not blame the theoretical physicists, because understanding quantum entanglement is way too much for the pathetic and vain-glorious figures of the IT field who are may have been involved in the implementation this project; we do not think it even worth to ask the converse: Did any of these project managers ask you for your input? Did even one single Minister of our IT-crazed society ask, that if IT is the way of the future (and with the shout and scream of “data security” jarring our ears rather than driving our minds), shouldn’t we ministers be abreast of the fields in this area? With a revolutionary technology already being implemented by the Chinese, perhaps we should avoid wasting Thousands of Crores on a technological project that will be in a very short while obsolete? Shall we mention here the fact that a Chinese Satellite, using this theory, is already in orbit — teleporting data via quantum-cryptography? If no, they are not fit to be Ministers. We do not wish to scare our lotus-eating Indians with ideas such as Reverse Engineering of the Brain, Genetic Algorithms, Directed Evolution, Cognitive Modeling, Electromagnetic-field-based Viruses for the Human Mind, Psychotronic Viruses, Remote Cerebral Control, virtual reality and neural computer interfacing. The terms neural- and bio- telemetry, bioenergetics, bioelectromagnetic nonthermal interactions, telecybernetics, Radio Frequency weapons, radionics, remote brain wave monitoring, can be seen in more than just one of the Western defense journals today. Several Western Defense publications will tell even a cursory reader that the acronym BRAIN stands for Biometric Recognition and Identification Network of the CIA, NSA and the DOD. While we certainly do not wish to panic-monger, our Defense Minister should at least be aware of these terms. Why then did our leading scientific establishments not provide even the most basic information about these terms in the Indian public debate? These issues need to be investigated by a strong, vibrant and well-guided scientific establishment. Did our Defense Ministers enquire on the investigation of these matters with our HRD ministers, the current HRD Minister being eulogized by our media which tells the Indian public “…. he has seen it all starting with student agitations?” Did we hear “Student Agitations”? PLEASE FOR GOD’s sake, these things cannot be understood by agitating students, unless he is somehow implying that the student-agitations were themselves caused by remote-control of their brains !!! Hopefully, by now at least our readers should understand that this is very possible. Alas, but our reader should have realized that HRD stands for Her-majesty’s Reusable/Recycleable Donkeys. What kind of a tragic joke is it, in this configuration of things, when our Finance Minister announces in the Rajya Sabha that firewalls will be used to guarantee our data-security in the year 2017?? Did our Defense Minister not SCREAM–SCCCRREEAAMM–at him for talking thus? If he did not, then those of whose who still have some semblance of a brain left cannot help but wonder whether our Defense Minister himself is a zombie created by the project MKULTRA (quite a few of whose operatives are publicly known to have lived in India), which has been known since the 1950s? “It is SECURE!” —“No, it is NOT secure!” –I am telling you it is Secure — No, I AM telling you it is NOT —Hoi Hoi Hoi, I am telling you it is Secure!! “NOO, IT IS NOT Secure”—-Hoi Hoooi Hoooi….Maaro Saale Ko. Thus do we identify the CAVEMEN OF INDIA, fit to be ruled again by the British. Next Section 5: Indians: Donkeys or Rats or Thieves of Carla Hills? Fingerprint the thieves! Previous Section 3: Students of India .…or Criminals of the Indian Government?